A case study about the bioremediation of petroleum contaminated soils using Custom HC, a bioremediation bacteria product. This case study is a quite simple illustration of the use of bioremediation bacteria to clean petroleum contaminated soils. Custom HC, manufactured by Custom Biologicals, is a bioremediation bacteria product. Custom HC contains petrophilic (oil-loving) bacteria selected because of their enhanced ability to degrade petroleum products, fuel oils, phenols and petrochemicals. The addition of bacteria with the intent of metabolizing petroleum or other chemicals is called bioaugmentation. Client Category: Ex-situ Petroleum contaminated soil. Location: Dade County, Florida, U.S.A. Problem: An underground leaking motor oil storage tank went unnoticed and unemptied for 15 years. Two batches of excavated soil were contaminated with motor oil. Contamination Size: The soils were removed resulting in two piles, batch1 and batch 2. Batch #1 208 cubic yards 18,000 ppm TPH (Total Parts Hydrocarbon). Batch #2 178 cubic yards 8,530 ppm TPH. Custom Treatment: Soil was treated separately with 2 gallons of Custom HC per cubic yard. Nutrients were added according to recommendations and aeration was provided. 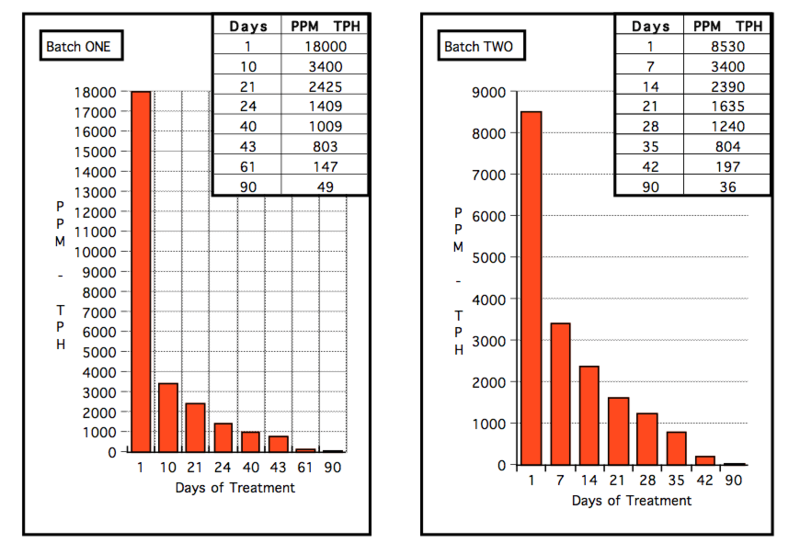 From the graphs, it is easy to see that both piles were treated by 90 days after the start of the bioremediation of petroleum. While this case study did not show the data, the cost savings in the ex-situ bioremediation of petroleum is substantial. Custom HC is the bioremediation bacteria used in this case study and it is manufactured by Custom Biologicals. Custom HC is available as a technical grade concentrate to save shipping costs. Additionally, Custom HC is available in a slow dissolving tablet, ideal for oil water separators. Contact Custom Biologicals for more information about Custom HC, bioremediation, and bioremediation of oil water separators.